We’re back with part 5 of Overheard in Product—a series where we round up all of the tantalizing conversations from product folks that you may have missed on the web last week. 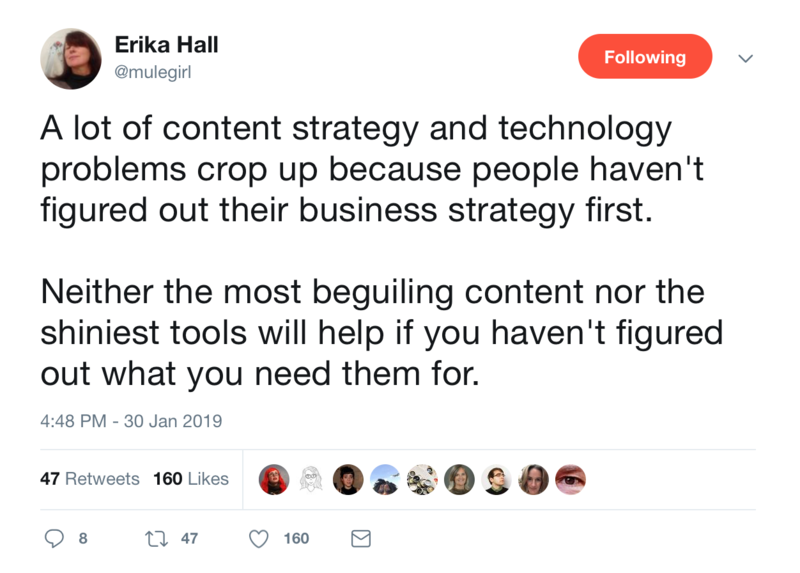 This week, we talk about emulation as a product strategy, why you need business strategy before content strategy, the Ian Malcolm Question, rude UX, and early bird specials. Jesse Weaver, Director of Entrepreneurial Design at CMCI Studio, wrote an interesting article, “Emulation Is Not a Product Strategy” back in December. Erika Hall, author of Just Enough Research, pinpointed the core problem behind a lot of perceived problems. Product-Medium was on fire this week. Adam Sigel, Head of Product at Hometap, introduced us to “The Ian Malcolm Question” on Tuesday. Adam compares opportunities at a company to mosquitos trapped in amber—in the fact that there are a lot of them. But, he cautions you to ask 3 important questions that would make Ian Malcolm proud before you jump on any opportunity. These kinds of questions seem to be going around in Boston: Harvard is embedding ethics into its computer science curriculum, urging the next wave of tech leaders to question not only if you can do something but if you should. Bonus: Healthy, wealthy, and wise? Researchers looked through ~700k people’s genomes to identify variations between night owls and early birds and paired it with the data from 85k people wearing activity trackers. Genes that were flagged in the study touched everything from your retina to processing stimulants. And it seems like being a morning person can be good for your mental health—self-identified early birds were more likely to report higher levels of overall well-being and lower rates of depression. Margaret Kelsey is a content marketer at Appcues. Before Appcues, she built content programs for InVision’s design community for 3.5 years and has roots in painting and PR. She’s a big fan of puns, Blackbird Donuts, and Oxford commas—probably in that order. We've been eavesdropping. Find out what product folks were buzzing about on social and Slack last week.